Ash clouds from the eruption of the Eyjafjallajökull volcano in Iceland continue to affect flights to and from Europe, canceling over 60,000 flights and affecting nearly seven million passengers. Many European airports, including most of the major ones, remain closed or open with very limited traffic. With many airspace and airport restrictions continuing until at least Tuesday, and perhaps for quite a bit longer, airlines are eager to renew flight operations, even though there is still ash present in the air above Europe. 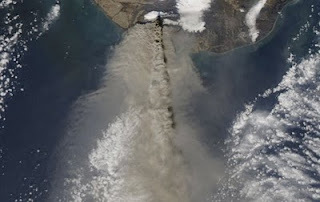 Current European regulations prohibit commercial aircraft from flying in areas containing volcanic ash, no matter how low the concentration. In other words, there are no defined safe limits for flights through volcanic ash. This is reflected in the standard procedures followed by airlines when it comes to volcanic ash - avoid it if possible, and carefully exit the area if the aircraft inadvertently encounters ash. Airlines and civil aviation regulatory bodies are faced with the dilemma of balancing risk and safety. By closing airspace and grounding flights, the aviation community has very effectively avoided any risks related with volcanic ask encounters, including aircraft damage and the potential for aircraft accidents. At the same time, the airlines can't avoid the financial risk of lost revenue from both airline passengers and companies that rely on air cargo services. Volcanic ash is very hazardous to aircraft, but the hazard faced by aircraft is very dependent on the weather. 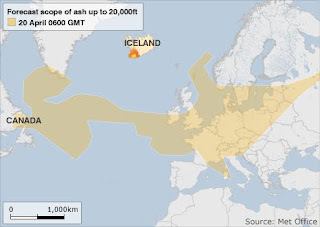 Currently, the ash cloud extends over most of northern and central Europe, and in the coming days may even spread eastward toward Greenland and Canada. Also, the ash is not spread evenly at all levels of the atmosphere, and it is possible that aircraft could fly through an area with volcanic ash, but at an altitude that is clear or nearly clear of ash. In recent days, aircraft from British Airways, Air France, and KLM have conducted numerous test flights with no passengers on board, and none have experienced any damage or any other problem due to ash. Lufthansa also plans to fly about 50 aircraft back to Europe on Monday and Tuesday, with about 15,000 passengers on board. Because the volcanic eruption may continue to go on for some time, and because it appears that aircraft may fly in the volcanic ash areas and avoid damage, several groups, led by the International Air Transport Association (IATA), are calling on European governments to figure out a way to resume flying and to do so safely in spite of the presence of volcanic ash, and in spite of the current industry practice of avoiding all flights in such areas. IATA is not alone. One of the more outspoken airline executives is British Airways head Willie Walsh, who, according to the Telegraph newspaper of London, said "The analysis we have done so far, alongside that from other airlines' trial flights, provides fresh evidence that the current blanket restrictions on airspace are unnecessary." He also went on to say that "We believe airlines are best positioned to assess all available information and determine what, if any, risk exists to aircraft, crew and passengers." Earlier in this article, the two risks that were mentioned were the possibility of aircraft damage due to a volcanic ash encounter, and the certainty of airline revenue losses because of canceled flights and closed airports. Unlike risks, which can be measured and defined in an objective way, safety is more like beauty in that it is in the eye of the beholder. It can't be measured with any kind of objective scale, and one person's idea of safety may be quite different from another's. The head of British Airways believes that is is in the best position to determine what risks exists. AirSafe.com believes that the traveling public is in the best position to determine whether flying in an area with volcanic ash is safe. Please feel free to respond to the survey below. Results will be posted in the coming days. Should the rules be changed as soon as possible? Have you been affected by the current situation? Will you fly in or to Europe in the next month? Is it safe to fly in or near volcanic ash? The results of the survey are available here.